Some of the most powerful stories in the Bible are about women – Eve, Sarah, Deborah, Ruth, Esther, Mary, Mary Magdalene, the woman at the well, and the woman who touched Jesus’s clothes, to mention a few of the more obvious ones. Their stories are stories of sin, disbelief, leadership, faithfulness, courage, faith and steadfastness. These stories speak to both men and women, and most likely because they are most of all human stories, things we recognize and understand. like a crowd gathered in the grandstand. These are not all dark poems. To the contrary, these are hopeful poems, not the least for the biblical characters represented and described. But what the addition of the non-Biblical poems does is to make the Biblical characters recognizable and contemporary – the woman who makes a terrible mistake, the woman who scoffs, the woman who assumes a leadership role, the woman who is faithful and caring even when no one expected her to be. 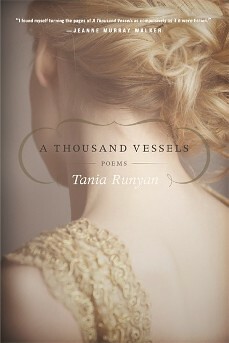 In that sense, A Thousand Vessels becomes a contemporary application of the Biblical stories. It’s a wonderful collection, full of faith, hope and truth. Looks like a fascinating collection. Thank you for spotlighting it.